The main thing is, through collage, to create a space for creativity, knowledge, exchange and debate. 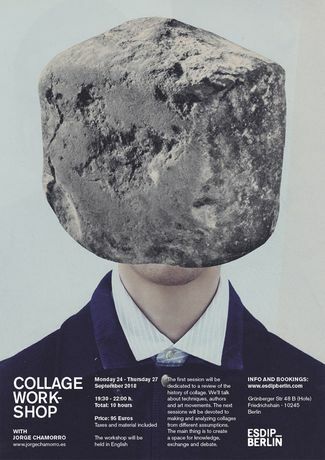 The first session will be dedicated to a review of the history of collage. We’ll talk about techniques, authors and art movements. 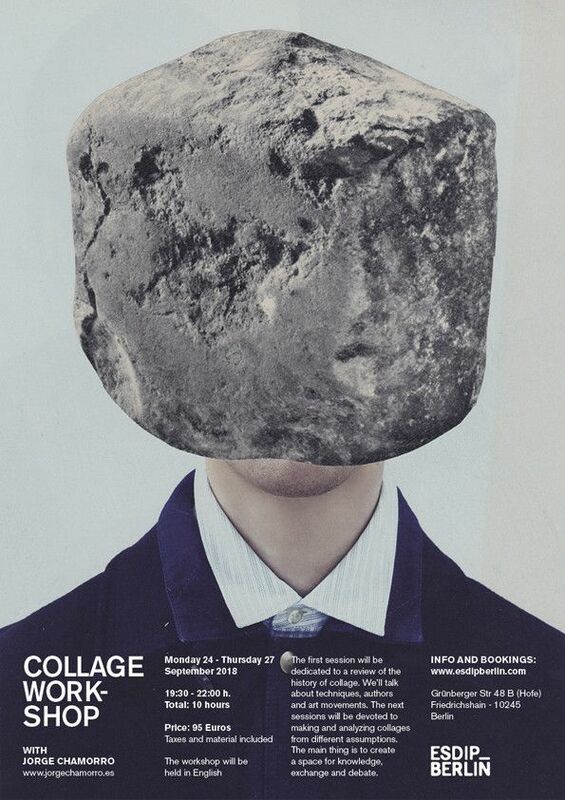 The next sessions will be devoted to making and analyzing collages from different assumptions. The main thing is to create a space for creativity, knowledge, exchange and debate. Jorge Chamorro (Madrid, 1972) is a graphic designer, teacher and artist. Bachelor’s Degree in Audiovisual Communication from the Universidad Complutense de Madrid in 1995, he worked for ten years as a graphic designer in several studios and agencies. In 2005 he starts to work independently, developing, up to now, communication projects for different clients and personal projects. He produced his first collage collection in 2006, and it has since become an irreplaceable artform. His collage work is always analog, without digital manipulation, using only photographs from books and magazines, scissors and glue. Since 2010 he teaches graphic design, typography, visual identity and collage. His work has been exhibited and published several times nationally and internationally. Since 2013 he lives and works in Berlin and Madrid.